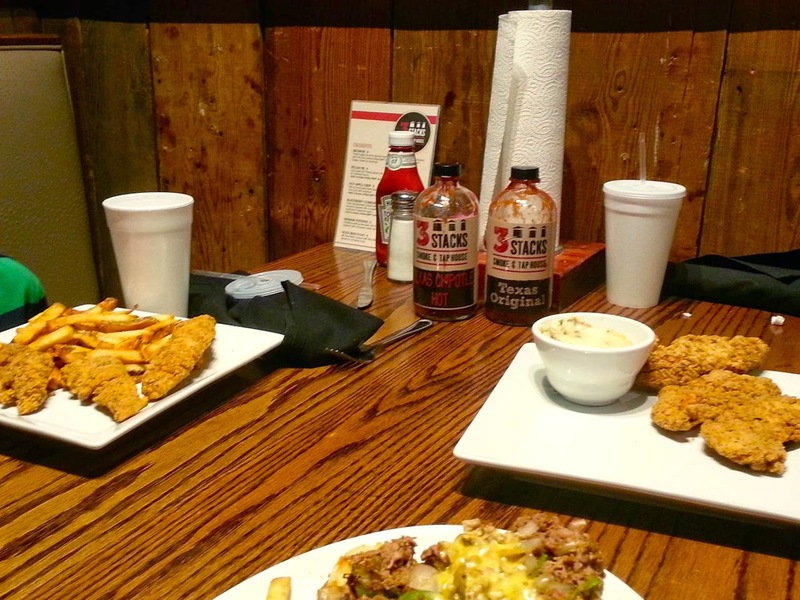 We're visiting my husband's sister's family in Dallas, Texas, and last night that took us out to dinner at 3 Stacks BBQ. BBQ is definitely better in Texas than it is in Los Angeles, so we're happy to get our fill of BBQ while we're here. It's kind of like a sports bar with TVs and a beer list. 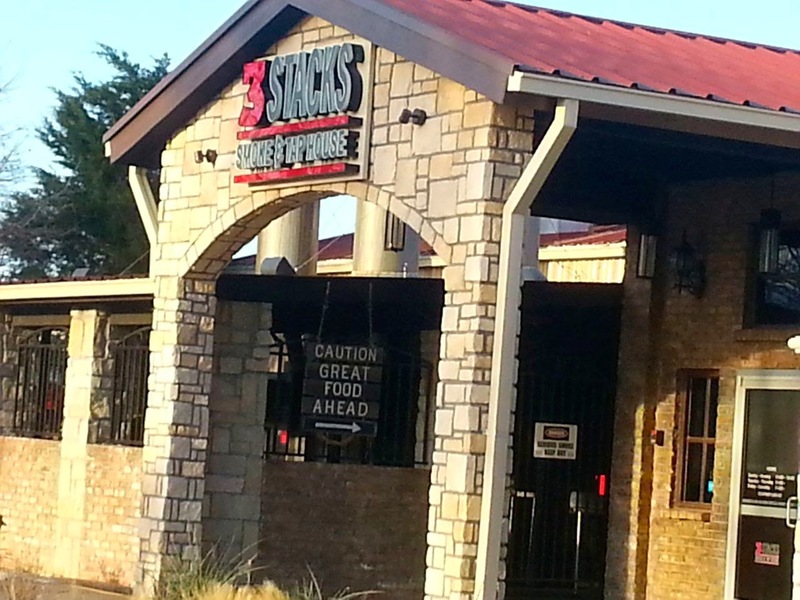 They have a variety of TexMex food and BBQ. I ordered Contessa's salad, which is described on the menu as "hearts of romaine lettuce tossed with a 1/4 pound of chopped brisket, beans, cheddar, pico de gallo, and crispy tortilla strips. Served with avocado ranch dressing." I asked for the salad without beans and with the dressing on the side. I ended up not using the dressing. It was okay, but I preferred the salad topped with the the spicy BBQ sauce that was on the table. It was a really good salad. 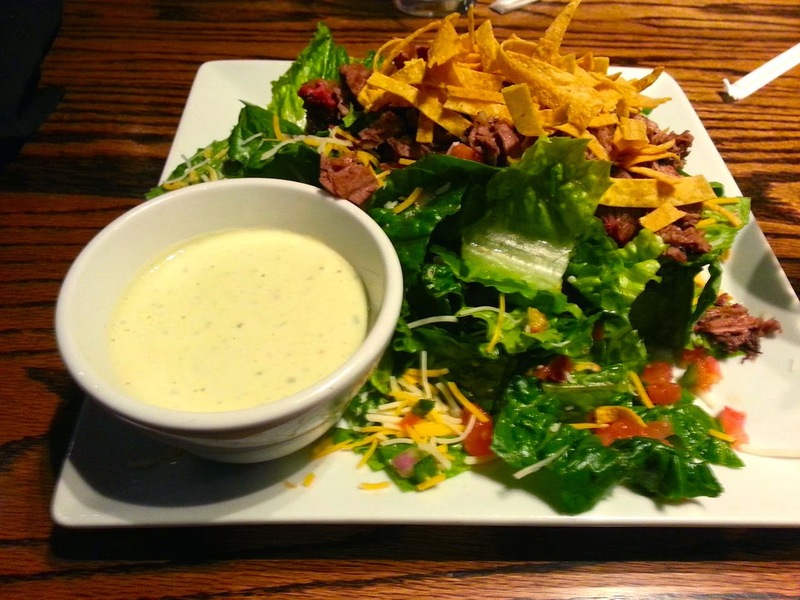 I had a brisket salad at a BBQ restaurant in L.A., and it wasn't nearly as good as this one. I could eat this brisket everyday. My husband was torn between ordering the Brisket Tacos and the Brisket Cheesesteak. Only in Texas. 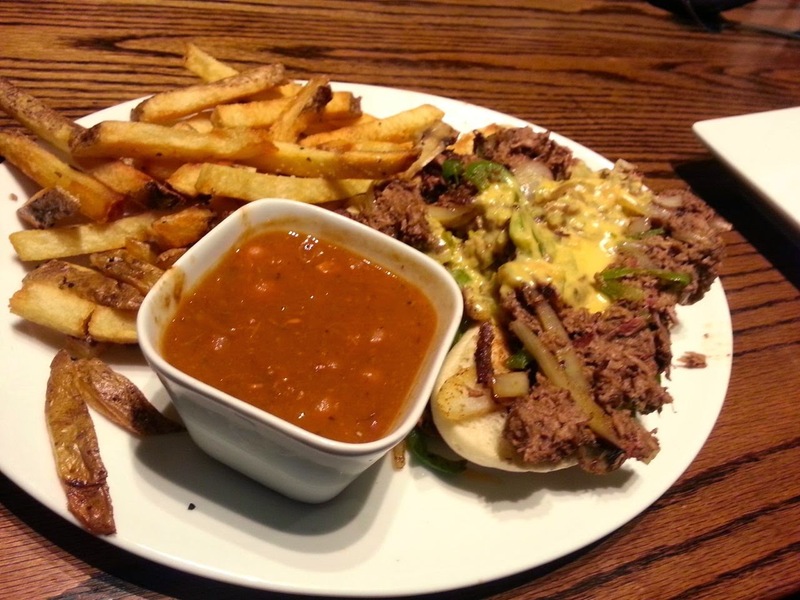 In the end, he decided to order the Brisket Cheesesteak, which is described on the menu as "brisket with sauteed peppers, onions, and mushrooms topped with our queso on a toasted hoagie roll." All the sandwiches come with beans (which are basically BBQ beans) and fresh cut fries. His sandwich was huge. I tasted a little of the meat mixture, and it was so good. I mean, how could it not be? I also tasted a couple of the fries. They are very crisp and flavorful fries. Our niece and nephew were with us, and they both got the kids' Chicken Tenders, which comes with a side. Our nephew got fries for his side, and our niece got the loaded smashed potatoes. She licked those potatoes clean. She only ate one of her chicken tenders, but she loved the potatoes. Our nephew ate all of his chicken tenders but didn't finish his fries. 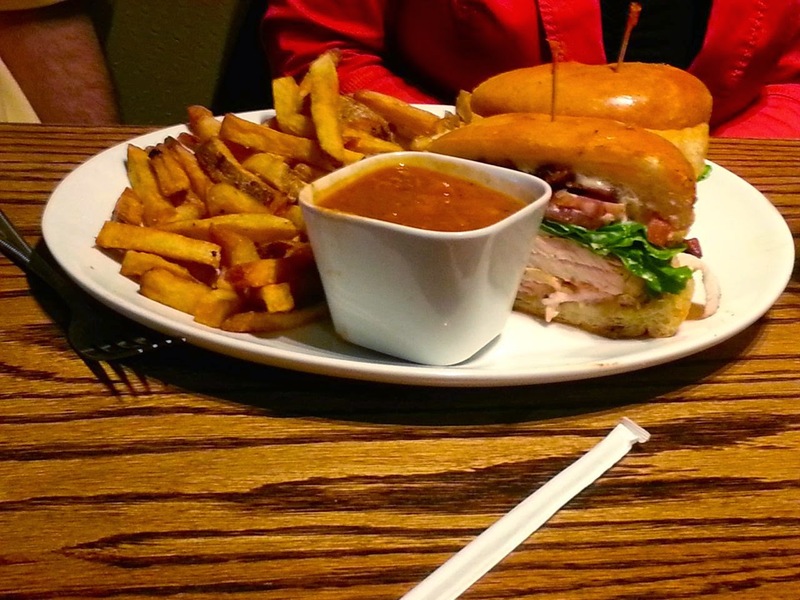 My sister-in-law ordered the Club 9 which is described on the menu as "smoked turkey breast thinly sliced served with bacon, lettuce, tomato, and mayo." Her sandwich also came with beans and fries. She shared it with her husband. It was huge. They really debated on how to even bite into it, but they managed. We were all too full for dessert, but the kids got dessert anyway. The kids' meals come with a complimentary ice-cream sundae. Once again, our niece licked her bowl clean. I really liked 3 Stacks, and I would totally go back if I lived in Dallas.